This special issue brings together essays written in response to particularly bad years for higher education, beginning with the global recession in 2008. The issue is split into three sections: “The University Gone Global”; “Humanities Salvage”; and “History on Regional Grounds.” Contributors include Michael Bérubé, Gert Biesta, Wendy Brown, Francesco Crocco, Laurent Dubreuil, Henry A. Giroux, Geoffrey Galt Harpham, Lyn Hejinian, V. Kaladharan, Charlotte Latimer, Annie McClanahan, Hélène Merlin-Kajman, Marjorie Perloff, Aaron Porter, Lionel Ruffel, Maritza Stanchich, Rei Terada, Michelle Ty, and Robert Paul Wolff. 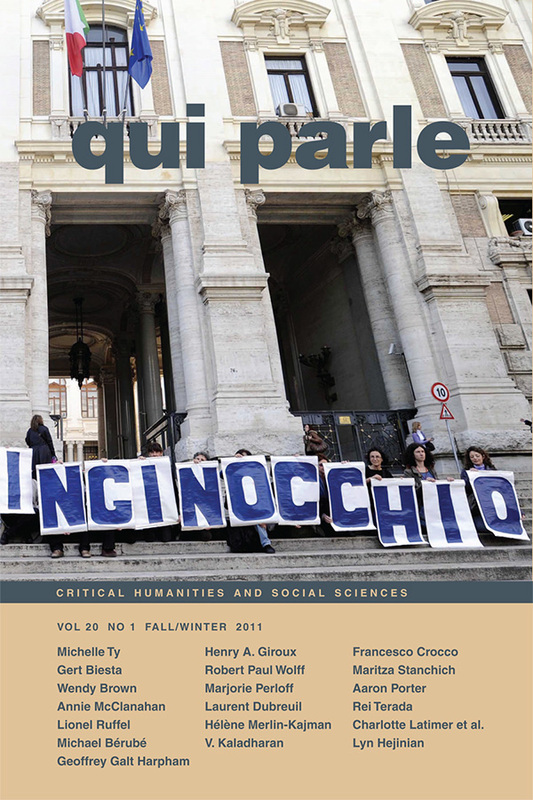 View the table of contents for Qui Parle 20:1, at the journal's online site.